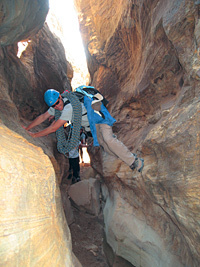 Tyler Baldwin '07 descends a tight gap in a slot canyon during the Leadership Expedition in Utah. When Tyler Baldwin '07 traveled to Utah in March, he learned that he couldn't let bad weather dampen his spirits. During this year's Kellogg Leadership Expeditions, Baldwin, along with eight other students and visiting Assistant Professor Christopher Bauman, faced the challenges of camping, kayaking and hiking along the San Juan River and San Raphael Swell for a week while battling rain and hail. These obstacles were part of the Kellogg Leadership Expedition, a program begun in 2006 by the Business Leadership Club and designed to challenge students with experiential learning opportunities that force participants outside their comfort zones to gain leadership insights. In addition to the Utah trip, led by Outward Bound Professional, 11 students traveled to Patagonia in South America with Clinical Associate Professor Michelle Buck, director of leadership initiatives at Kellogg. That excursion was led by National Outdoor Leadership School. While the locations' landscapes were different, the students shared similar experiences, learning to establish responsibilities, manage stress and absorb important lessons. Michael McClurg '07, who coordinated the Patagonia trip, said that Buck taught them the importance of reflection, a critical but often-overlooked leadership component. Buck noted that a study of extraordinary leaders found that all practiced daily reflection, either through meditation, journaling or similar activities. Both Kellogg trips provided students with opportunities to reflect on their leadership skills. After returning to campus, they met to discuss their experiences and stories. "Leaders can communicate powerfully when they communicate through stories," said Buck. When faced with a difficult situation, leaders focus on what the experience can teach and how they can apply the lessons later, she said. This storytelling also creates symbols to reinforce the leadership experience. For Baldwin, one symbol is found on his backpack — a pin he and the other participants received at the trip's conclusion. While some of the Utah participants faced their rugged challenges for the first time, Baldwin, an experienced outdoorsman, found his test was in keeping a positive attitude. "I realized that the weather wasn't changing, and I could be in a bad mood or assess the situation and make the best of it." Once he saw this opportunity, he organized a hike to keep the group active despite the rain.